For all you Simpson’s fans out there, This was the easiest costume I have ever made. I started with a set of blue scrubs, a red sheet, an old belt, 3d glasses from the theater, a red baseball cap and half a dozen beer cans, Avery sticky paper, and iron on transfer paper. I created the beer labels and the Duff logo for the shirt and hat on the computer, printed the beer labels on the sticky paper, wrapped the beer cans, printed the Duff logo and printed on the iron-on transfer paper, transferred it to the shirt and hat. Once the beer cans were looking good I poked two holes in the back side of the cans and zap strapped them to the belt leaving the buckle at the back. Sewed a cap to the shirt and what I had left over from the red sheet was sewn to the pants to look like underwear. All my male friends want to borrow this costume. 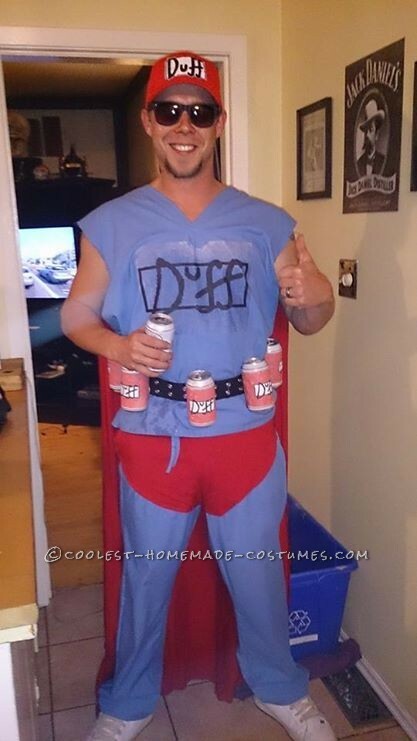 I won multiple costume contests with this Duff Man costume!